For founder of Dark Fable Media, Richard Oakes, filmmaking has been a passion since early childhood. "Even at young age I loved the idea of making films, I used to ride my bike around in circles, thinking up film ideas until it got dark," he recalls. "I watched every single making of I could get my hands on." Investing in a professional camera and visual effects software, as he grew older, Oakes began teaching himself filmmaking. Years later, after having completed a degree in con-temporary music production, he quit his day job to start Dark Fable Media, a music video production company, whose clients Universal Records, EMI and Gibson. Despite all the Dark Fable Media's success, however, Oakes still ultimately dreamed of realizing his childhood ambition: producing a full length feature. Taking on fewer paid jobs, Oakes began to live on the breadline during the day, and work-ing on his dream through the night. Finally, seven years after first being inspired with the original idea, he completed work on a proof of concept for his very own science fiction fea-ture, "Exit Plan", shot on the Blackmagic Pocket Cinema Camera and graded with DaVinci Resolve. 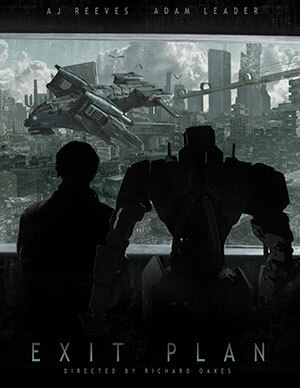 Set in a dystopian future, "Exit Plan" tells the story of exile Adam, a man trapped in the slums. Machines have become the sole workforce on Earth and the lower classes are deemed surplus to requirements, banished from the utopian cities to starve. As rebels plot against the elite, known as The Order, Adam discovers the Earth will soon be destroyed by a cosmic natural disaster and needs to find a way off the planet together with his only companion, a robotic helper named iO. "Exit Plan" cost just $2,600 to make, all raised on crowd funding website Indiegogo. Of course, creating a short on such a restrictive budget did not come without its challenges. "The main shoot was done on a farm in Wales," remembers Oakes. "Two crew members actually pulled out the day of shooting due to illness, which left us with a crew of just four people including the two main actors. On top of this tiny crew we had to shoot the entire film in a space of only three and a half days. We ended up having about 30 minutes sleep every night before starting all over again the next day!" Our main camera package was the Blackmagic Pocket Cinema Camera, equipped with the Metabones speed booster, and a simple shoulder rig with follow focus - this gave us a nice organic feel," Oakes continues. "After using DSLRs for years I got sick of seeing the compression you get with h264. So I invested in the Blackmagic Cinema Camera and was blown away with the dynamic range, and the latitude that afforded, as well as the fact you could film in 10-bit ProRes. I then tried the Pocket Cinema Camera and was amazed by how similar they were. The Pocket was an easy choice for "Exit Plan" for its ease of use and portability, especially as I was aiming for a very hand held look." "For lenses I used the Sigma 18-35mm f1.8, which in my opinion is the perfect lens for this camera. In combination with the Metabones adaptor, the Pocket Cinema Camera performs very well in low light conditions, which is great as a lot of our shots were in very dark, gloomy locations. I also used a 100mm Macro lens from Canon for close up work." As well as creating all the many visual effects needed for "Exit Plan", including a third of the sci fi locations shot on a full green screen and computer generated, Oakes also took charge of editing the film, creating all the sound design, and finally grading "Exit Plan" - the final DI was carried out in DaVinci Resolve. "Science fiction has always been one of my favorite genres after growing up watching films such as "Star Wars", "Alien", and "Total Recall,"" concludes Oakes. "And having a love of VFX also lends very well to this as there isn't much opportunity to show off your CG skills in a romantic comedy! I don't see directing and VFX as two separate disciplines in my line of work as the VFX is just the picture post I do for the videos I've directed." "As far as influential directors, I respect Ridley Scott for his execution of "Alien", Neil Blomkamp for his unique style, and finally Gareth Edwards because he came from nothing to being in Hollywood through doing his own visual effects, much as I am doing now." "As for the color grading, I used the OSIRIS Vision 4 LUT in DaVinci Resolve as a basis for the entire film and went from there," he explains. "I wanted a very dark, grimy look, and throughout my past with DSLR, the latitude just wasn't there to push and pull the image to get the results I was looking for. Using Resolve and the Blackmagic Pocket Cinema Camera footage together allowed me to push the image further than ever to give the entire film the exact feel I was looking for, giving me much more control."